The aim of the game is to achieve the highest score. You can only score on a roll which does not include the numbers 2 and 5. Any dice which show a 2 or a 5 become stuck in the mud. Choose a player to start. Roll all 5 dice. If you have rolled any 2s or 5s, you do not score any points for this throw. 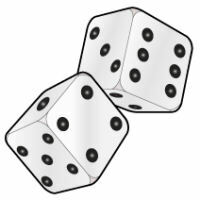 If you have not rolled any 2s or 5s, add up the total of the dice and remember it. Set aside any 2s and 5s, and throw the remaining dice. Again, if you have rolled any 2s or 5s you fail to score this turn. Throws without 2s and 5s are added to your previous total. Continue in this way until all your dice are stuck. Write down your score, and pass the dice to the next player. Agree a number of rounds (five works well) and total up the score. You can use the score charts we have provided. You will be surprised at how much the score can vary and just how tricky the dice can be!